Recently there were two very important blog posts discussing the evolution in the development of Mozilla Open Badges. 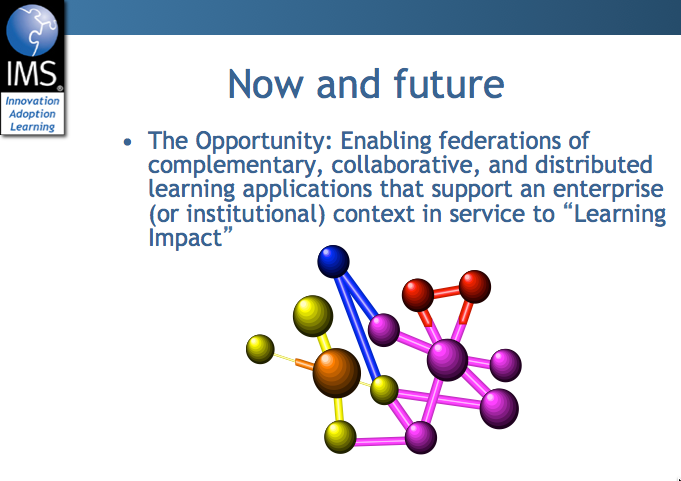 "Open Badges has continued to evolve. In mid-2015, the Badge Alliance spun out and became a part of Collective Shift, a nonprofit devoted to redesigning social systems for a connected world. 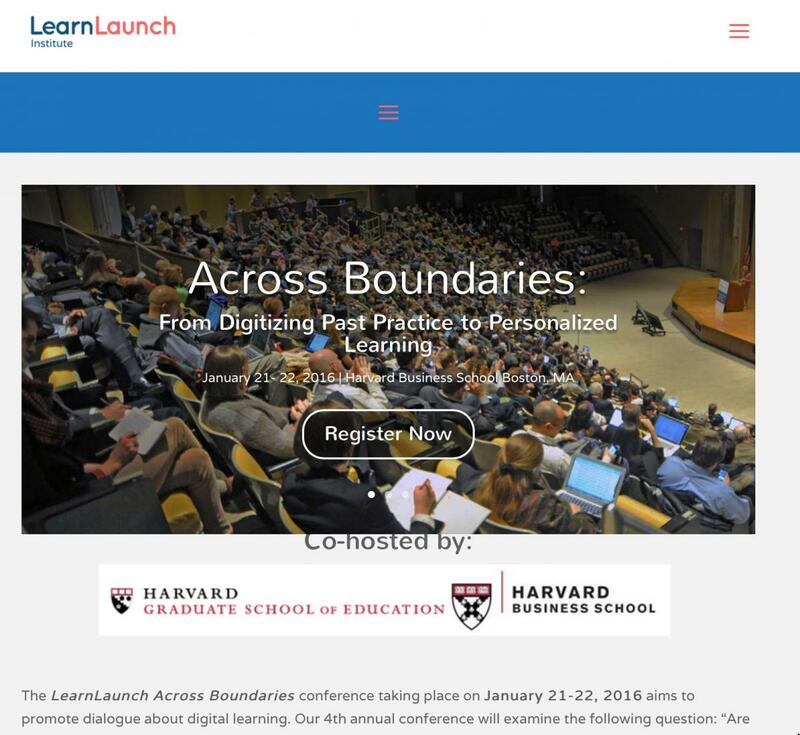 The Badge Alliance will work in concert with another Collective Shift project, LRNG, which is creating a global ecosystem of in-school, out-of-school, employer-based and online learning that includes a technology platform for badges. With continuing support for the Badge Alliance and LRNG’s push to make badges part of connected learning experiences for youth, the Open Badges community remains active and growing. Nate Otto, Director of the Badge Alliance, leads standard development efforts, while a growing band of implementers cooperate to improve the options for using Open Badges to recognize learning across many environments." The second important blog post is from Nate Otto, the director of the above-mentioned Badge Alliance. In Nate’s post he stresses the importance of community collaboration to guide the work and create a shared investment in Open Badges. Our thanks go out to Collective Shift for making the investment to reinvigorate the Badge Alliance, including building out a Badge Alliance team with Nate’s leadership! At IMS Global we have committed to a substantial investment on behalf of our members in Open Badges. 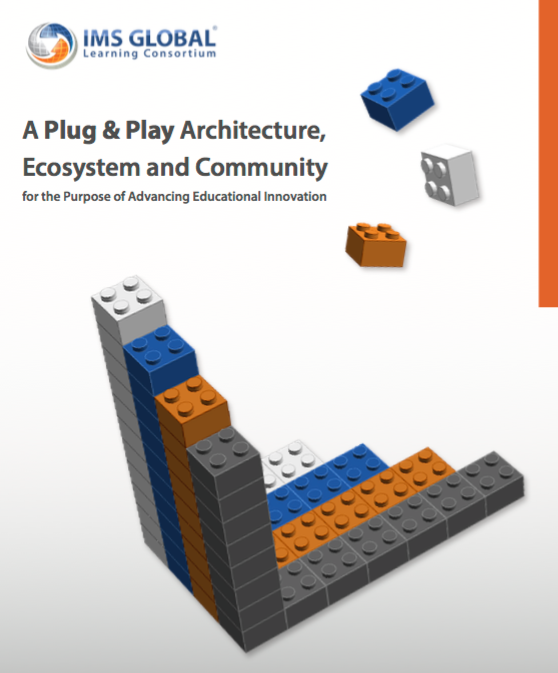 We believe that an evolution of the Open Badges specification can serve as a key component in creating a better future for educational credentials in higher, K-12 and lifelong education. And getting to a better future for educational credentials is a challenge that IMS has taken on as one of our five major initiatives. Putting it bluntly, current educational credentials (grades and test scores) are woefully inadequate as we move to the future. IMS has begun working on a number of areas involving the application of Open Badges. We are working closely with the Badge Alliance, Collective Shift and Mozilla Foundation, and of course with our 350 member organizations. Our focus is to ensure that Badges will provide a clear value across a full range of educational accomplishments and that they can be compiled into official e-transcripts and a highly effective and comprehensive student record. Investment on improved conformance certification will be a major track of the IMS work. Thus, IMS Global has made a major commitment to Open Badges. And, via the collaboration with the Badge Alliance we are committed to bringing that work back to the broader Open Badges community as it proves its merits. Today, IMS announced what we expect to be a very long and fruitful partnership with the Ed-Fi Alliance. The Ed-Fi Alliance, funded by the Michael and Susan Dell Foundation, provides standards and software for the actionable use of data by K-12 states and school districts. IMS, of course, focuses on EdTech interoperability standards with our goal being to enable an open ecosystem of innovative learning platforms, apps, tools and content. 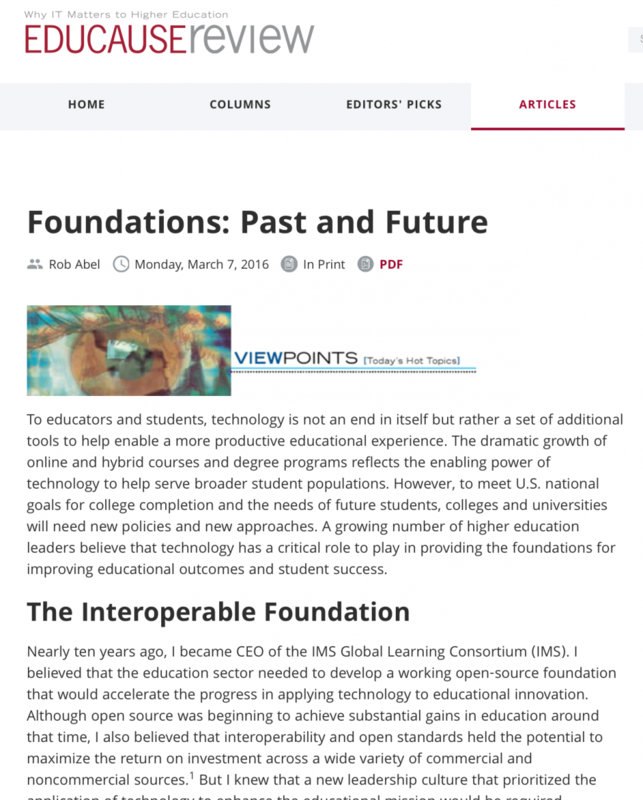 The essence of the announcement is that IMS Global and Ed-Fi will collaborate on K-12 standards – bringing together IMS’s “front-end” learning technology standards with Ed-Fi’s “back-end” data standards. 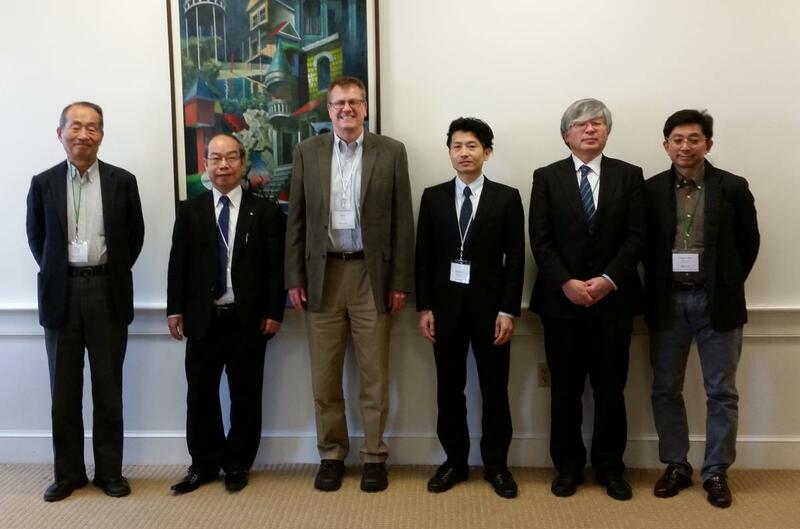 The partnership will begin with Ed-Fi adopting IMS’s OneRosterTM standards and actively contributing to the work. From there Ed-Fi and IMS will be targeting several additional high need areas in order to accelerate connecting district level to state level systems. These additional areas include assessment, learning analytics and digital credentials (competency-based education and digital badges). If your organization is interested in OneRoster, we have a full day of OneRoster activities coming up February 23 at our next quarterly meeting at UMUC. IMS chooses our partnerships with other standards organizations and activities carefully. Our view is that it is extremely important that your investment in standards goes toward a foundation of interoperability that the sector can trust for years to come. We believe that the track record, growth and approach of working with the market merits that trust. At IMS we get the sense that Ed-Fi has the level of support that makes it a solid choice for districts and states. The commitment of the Dell Foundation to Ed-Fi is impressive. And, Ed-Fi adoption now dwarfs other K-12 data standards alternatives. IMS and Ed-Fi working together will bring together two very strong organizations to accelerate the connection between IMS’s huge base of edtech adoption with the data systems and dashboards that are using Ed-Fi now and in the future. IMS feels very good about the potential for the Ed-Fi partnership and we are committed to its success. It is also becoming clear that OneRoster is one major step closer to fulfilling its promise. The member organizations of IMS Global are reinventing how edtech interoperability standards are created, disseminated and applied. And it is changing the edtech landscape for the better every day. K-12 regional conference (Boston/Massachusetts) of about 700 people, revolving around the state of EdTech and the opportunities for entrepreneurs. We had about 70 people in the room – about 80% were familiar with LTI (which in itself speaks volumes for the penetration of LTI into U.S. K-12). There were three other supporters of IMS standards on the panel: Claudia Reuter (HMH), Stephen Laster (McGraw-Hill) and Leo Brehm (Newton Public Schools, MA). Very good group – and Stephen’s moderation made for a lively discussion. Of course there was lots of talk about why standards are important and why they make sense as an underpinning of the future of EdTech. I pointed out that the growth in IMS (as detailed here) certainly would seem to be indicating that momentum continues to build. IMS cares a lot more about ensuring the necessary collaboration to remove barriers than we do about owning a standard. Being an organization/movement that is credible enough and strong enough to collaborate with sector heavy weights (suppliers and institutions) – and find workable solutions that remove the integration barriers thwarting innovation. Conducting a very hands-on approach to making sure interoperability works for suppliers and institutions on reducing the actual barriers they are encountering. Another way to say this is: By interacting with suppliers and institutions while new capabilities are being deployed and by applying a critical mass of engineering talent (from members and staff), IMS is ensuring that we not only have an approach to interoperability but hopefully, the best approach. It is IMS’s firm belief that we can only get to having the best approaches by working real integration challenges with real suppliers and customers. Standards developed solely in a backroom with so-called standards experts pretty much fail every time – even if there is some government agency pushing/requiring them. Ensuring the success of diverse products from diverse sources becoming part of a successful open EdTech ecosystem. Ask any IMS staff member what is the most important priority in IMS and they will tell you: “Making sure each of the IMS members can implement the plug and play interoperability that IMS promises.” IMS will literally drop everything to work with our members to solve integration challenges, especially if the products have gone through IMS certification, in which case we virtually guarantee that we will make it work. Is IMS really good at all the hard work of publishing great standards and getting them approved nationally and internationally? Absolutely. IMS is great at standards. And, this is definitely not a minor consideration: IMS literally has two decades of experience making sure our standards can span the world and stand the test of time and thus maximize our member’s investment. However, the primary reason why the IMS member organizations are changing the world of edtech is that they are providing the necessary leadership in solving the integration issues that need to be solved to enable greater innovation. If you want to help lead the revolution, come join us! Some of the best interoperability standards capture the “dah” situations where custom integrations just add cost and little to no value beyond what a standardized integration brings. 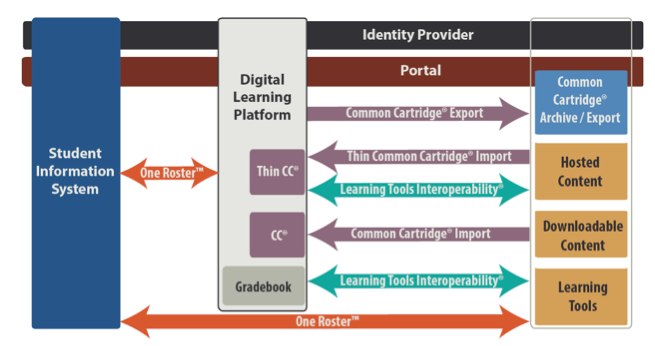 Every K-12 student system, learning platform and application (of which a large district is dealing with hundreds) all solve the same problem – synchronizing the information on the courses, the teachers, the students – in terms of who should have access to what (aka authorization to tech people). But, they all solve it differently. This has turned out to be the cause of massive time, cost, headaches for school districts. IMS Global has many years experience addressing forms of this problem in higher education. One of IMS’s oldest and most widely used specifications is something that is now called Learning Information Services (used to be called IMS Enterprise back in 1999 when it was first created). About three years ago IMS members doing some work in the state of Delaware began collaborating on a simplified and extended version of LIS for K-12. 1. 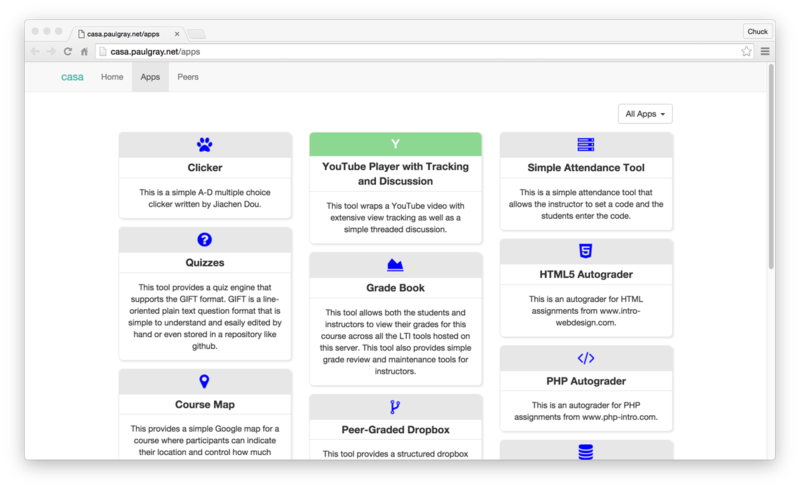 No longer needing to spend the time and money to support all the special rostering formats of all the different EdTech products, publisher content and apps. 2. The district has complete control over their roster information and decides which applications receive which portions of the data. 3. It’s an open standard from IMS Global – so ability to add/upgrade/switch among the very large IMS Global ecosystem is a given. 4. When used in conjunction with IMS LTITM (Learning Tools InteroperabilityTM) to launch and communicate with the rostered apps, a seamless foundation for providing insight to teachers, students and parents with respect to engagement and progress is established (an advanced topic that is the academic motivation for connecting these apps in real-time). When you find the “dah” everyone agrees – institutions and suppliers. I was pleasantly surprised along this OneRoster journey that even the suppliers were tired of the myriad of formats. This is a good sign: Suppliers are realizing that it is better to expend resources on improving the digital apps, tools, content than on myriad custom integrations. This is exactly what standards are meantto do: Shift the investment from the connectivity so that it can go towards the quality of the products. But, K-12 suppliers planning to be ready to implement OneRoster in time for Fall 2016 back to school need to get ready now. IMS is facilitating a special hands-on boot camp and plugfest for OneRoster at the IMS quarterly meeting the week of February 22 at University of Maryland, University College. At the February quarterly meeting OneRoster session, leading OneRoster supporters, such as Classlink, HMH, McGraw-Hill, Pearson, SAFARI Montage and others will be there to help the IMS community members learn how to implement OneRoster and perform conformance certification. At the May Learning Impact Leadership Institute in San Antonio, Texas a follow-up session will be held, including witnessing of the plugfest results by IMS district members. Hope to see you in February and May! Well, while there is no way to know for sure, I would put good money on IMS Global being the most rapidly going of any major tech standards consortium around the world. Indeed, most tech standards organizations we know of are at best flat to down – some way down. Unfortunately, many other education-related standards activities have perfected the art of treading the same old tired waters of highly restrictive standards created by a few "standards experts" rather than the marketplace. Bucking the trend, 2015 was another year of record growth for IMS Global Learning Consortium. IMS added 65 net new members bringing the total member organizations to 339 at end of year. As many of you know, IMS had a total of 50 members in early 2006. So, in 10 years we are roughly at 7x and, of course, are adding more members a year now than we had total in 2006. Why is IMS growing so rapidly? IMS is a key factor in sector advancement in several very important areas: scalable adoption of digital learning tool/app/platforms, learning analytics, digital educational credentials/competency-based education, e-assessment and integrated digital curriculum. What is the effect of this growth? IMS is having a very positive impact on the educational technology sector. And the reach is growing. In 2015 IMS presented 50 times at major events! Not counting our own. Almost 1000 people attended IMS events in 2015. 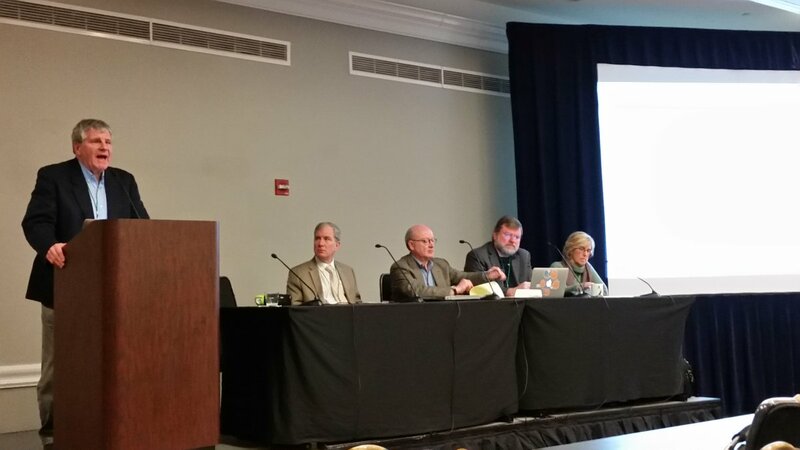 IMS continues to grow its collaboration with high quality partners such as EDUCAUSE, APLU, AACRAO, Internet2, CNI, C-BEN, ISTE, CoSN, The Council of Great City Schools, IDPF/ePub, W3C, Mozilla Foundation, MacArthur Foundation and the Bill & Melinda Gates Foundation. At least as important is the amazing uptake of the IMS standards in the EdTech sector. Believe it or not, there are now over 70 learning platforms (of a wide variety) that are IMS certified as consumers of LTI (Learning Tools Interoperability). 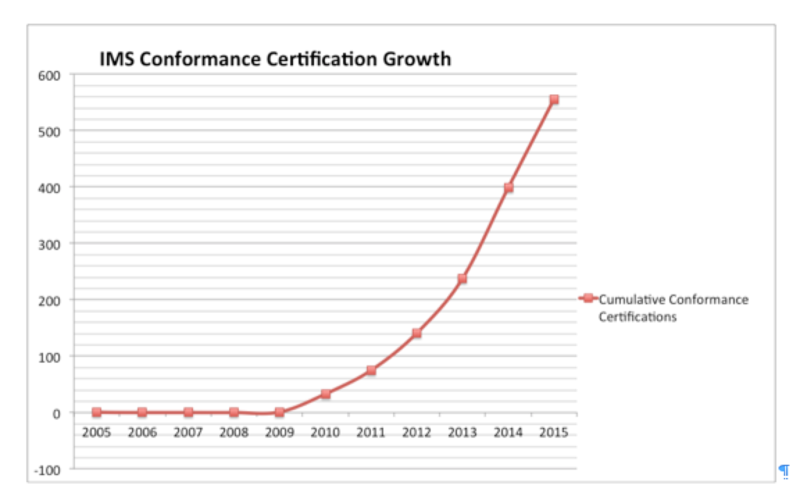 There were a total of 157 conformance certifications issued by IMS in 2016 – roughly 3 a week! Here are now more that 375 products that have been certified. You can take a look at the new Product Directory section of the new IMS web site, available at imscert.org. Speaking of the new web site: Wow! Lot’s of work for all concerned – but well worth it. It is a lot easier to understand the IMS Initiatives and IMS Technical work, not to mention the different opportunities for membership, supplier leadership and institutional leadership. All of this is possible because of the leadership and investment made by the IMS Member Organizations. IMS is primarily about one thing: The education sector leading and taking responsibility for the shape of the EdTech ecosystem of the future. Everyone invests a little and gets a lot in return by collaborating on the open EdTech ecosystem. I am very pleased and proud of the breakthroughs the members are making every day! 2016 is going to be another great year as the open EdTech ecosystem continues to grow and revolutionize the ease with which innovation can make its way in education institutions around the world. 2015 was so busy that I found it difficult to find time to update the blog. Fortunately, IMS’s growth has allowed us to add some great staff, in addition to those you already know and love. I’m hoping to write more frequent, brief blog posts to let you know about the IMS Global priorities and accomplishments.